Also possible as a customized trip for a minimum of four people. Singalila range in the background. considered sacred to the Sikkimese. KarmaQuest Director Karma Lama invites you to experience one of the “top treks of the world,” tracing the ridgeline that separates Nepal from Sikkim (India) – historically, a border not easily given up by either side. Beginning in the Himalayan foothills of Sikkim, you’ll climb to 12,000 to 14,000 ft into the clouds before descending into a deep river valley carved by torrential monsoon rains. Traverse a glacial moraine and again ascend to picturesque Goechela (16,200’), bringing you face to face with Mt. Kangchendzonga (photo left), third highest peak in the world. Kangchendzonga is the centerpiece of Kangchendzonga National Park, and her summit has (reportedly) never been climbed out of respect for her sacredness. Unlike trekking in Nepal, most of the trek route is in uninhabited mountain areas, without permanent settlements. All inclusive trek support services are provided, with porters and/or livestock to carry gear, three meals a day cooked by a team of cooks, and guides to accompany you. 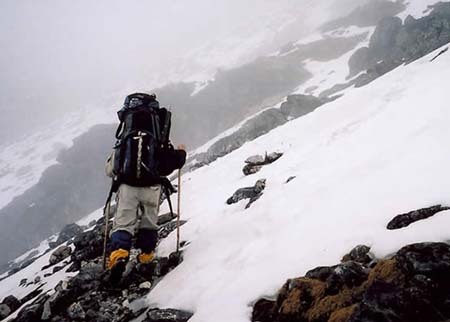 Eco-trekking standards – codes influenced by KarmaQuest’s long-standing as an ecotourism advocate in Sikkim – are met, including removal of all waste, and provisioning of staff with warm clothes, tents and alternative fuel or cooked food to reduce the human footprint. Before and after the trek, you’ll be treated to family hospitality at Karma Lama’s home in Temi, and will learn about Sikkim’s culture and conservation strategies from a local non-profit/visitor center in Yuksom. A final two-night stay in Gangtok, capital of Sikkim hints at this state's prosperity, with a bustling open-air pedestrian shopping boulevard and a growing coffee house culture. Day 1: Overnight in Delhi: Transfer to your hotel in Delhi, included in the trip package. Day 2: Delhi: Rest in the morning. Afternoon enjoy a half-day sightseeing tour Delhi. Overnight at hotel. Day 3: Welcome to Sikkim. Fly to Bagdogra (2.5 hr) and drive 4 hrs to Temi, one of the most heavenly spots in Sikkim. Check into Cherry Resort for two nights at 5,800 ft elevation. Day 4: Temi: Awaken to a picture-perfect view of Mt. Kangchendzonga on the horizon. After breakfast on the veranda, hike to a lookout point or just rest and enjoy the fresh mountain air. Visit Karma’s nearby family home (photo left) for a taste treat: a fermented millet drink called tongba. Day 5: Drive to Uttarey: (6,560 ft), where you’ll spend the first night in a simple trekking lodge. Day 6: Trek Chiwa Bhanjyang: (10,200 ft). A gently ascending trail passes initially through rainforest until a final steep ascent to the first camp (6 hrs). Overnight in a tent (as per throughout the trek). Day 7: Chiwa Bhanjyang: Rest/Acclimatization Day Hike to nearby Singalila Peak at 11,480 ft for some excellent views. Day 8: Trek to Dhor: A moderately gentle uphill walk traverses forest and a more exposed hillside, approaching the first passes, adorned with prayer flags and with views of distant mountains. (7-8 hours). Camp at 12,500 ft in a sheltered hollow below the ridge. Day 12: Rest day to explore the area or use this day to break up the next long day. Day 13: Trek to Tikip Chu: You’ll again ascend to high mountain terrain. Then drop down into the meadows of Kokling, from you can see ahead to the next pass (14,100 ft). Once again you’ll end the day’s hike with a steep descent to your campsite by the Tikip Chu (river). (8 hours. Camp 12,630 ft). Day 15: Rest Day in Dzongri: Enjoy a rest day exploring the meadows and view points of Dzongri. Note: this day could be used elsewhere on the trek as needed. Day 18: Trek Tshoka: The return route passes through an enchanting forest of rhododendrons, ablaze with color during spring; and emerges in the tiny settlement of Tshoka, once occupied by yak herders. (5 hours. Camp 9,840 ft). Day 20: Yuksom and Gangtok: Learn from a Yuksom-based conservation group (KCC) how it led the Sikkim-wide ban on plastic bags, enforced a no-firewood use in the Park, and instituted a leave-no-trace garbage management policy for trekking groups. In the afternoon, drive to Gangtok (4-5 hrs) and overnight in a charming Sikkimese style hotel in Gangtok. Day 21: Gangtok: Explore and shop in Gangtok’s main bazaar. Your guide will lead you to some interesting spots including an orchid display and Tibetan Buddhist homage sites. Gather for a Farewell Dinner. Day 22: Depart Sikkim, fly to Delhi Drive (4 hours) by road to Bagdogra for your flight to Delhi. Transfer to Delhi international airport depart Delhi for home or your onward journey. Our services end in Delhi. If you would like to travel onward, please ask us to help you plan a trip extension within India, to Nepal, or to anywhere in the region.